Another State Expands Constitutional Carry! While the media has been hyper-focused on bad gun control bills at the national level, the reality is that good things are happening around the country. Just this week, Idaho’s Governor Brad Little signed a GOA-backed Constitutional Carry Expansion into law. 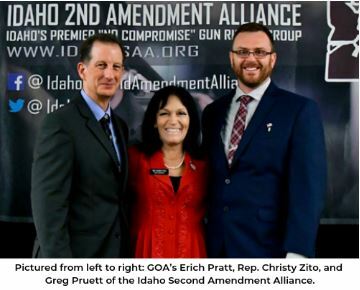 Rep. Christy Zito authored the bill, which was also pushed inside the state by the Idaho Second Amendment Alliance. Idaho already had Constitutional Carry, but only for those who were 21-years-old and above. So the new law in the Gem State will drop the age for permitless concealed carry for those who are 18-years-old. Idaho is not the first state to improve its concealed carry laws this year. Three other states passed GOA-supported bills, thus entering them into the Constitutional Carry Club for the first time: South Dakota (January), Oklahoma (February) and Kentucky (March). This brings the total number of permitless carry states to 17. GOA is pushing legislation to deregulate suppressors and allow gun owners to purchase them, as they would any other firearm accessory. And at the state level, GOA is supporting legislation to decriminalize the possession of suppressors. For example, in Texas, HB 2286 would keep state officials from arresting any gun owner who possessed a suppressor without paying the NFA tax. To help mobilize grassroots support, GOA’s field director Rachel Malone produced a “myth buster” video where she takes on three of the most common misunderstandings relating to suppressors. Her video also calls for grassroots action in support of national legislation to deregulate suppressors. Gun owners can view Rachel’s video here and expect an alert soon in support of legislation in Congress. Gun Owners of America is fighting red flag gun grabs and Universal Background Checks all across the country. So far, the majority of states have refused to pass new gun control laws. But then there’s those states that have been overrun by anti-gun Democrats. They are shredding the Constitution and ramming new gun restrictions into law. And it’s in these states, that pro-gun counties are restoring the rule of law by passing Second Amendment Sanctuary Ordinances. This concept is sweeping the nation. Such ordinances have already passed in over half the counties in Washington … twenty-eight out of thirty-three counties in New Mexico … and sixty-three counties/municipalities in Illinois. In all, over 130 counties across the country have declared themselves to be Second Amendment sanctuaries, and over 200 have stated they will not enforce red flag gun confiscation orders. GOA is actively working to get more counties to pass Second Amendment Sanctuary Ordinances. A sample can be viewed here. And we have long encouraged sheriffs to uphold the Constitution and refuse to violate their oaths of office. Well, one sheriff needs no prodding — Weld County Sheriff Steve Reams in Colorado. 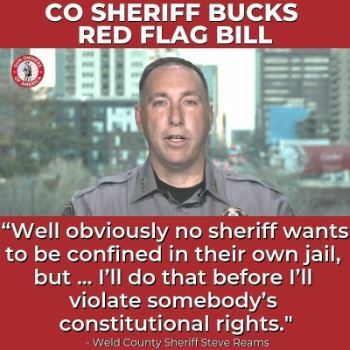 When the legislature in the Centennial State recently passed a red flag gun grab, Sheriff Reams publicly announced that he would not enforce the unconstitutional law. GOA applauds Sheriff Reams for his commitment to the Constitution — and his commitment to defending law-abiding gun owners. Senate filibuster to go the way of the Dodo Bird? Finally, GOA activists who have Republican Senators received an emergency alert this week. On Wednesday, Senate Majority Leader Mitch McConnell forced a vote to reduce the amount of time allowed for debate on most presidential nominations — after a filibuster is defeated — from 30 hours to 2 hours. To many, this might seem like an “angels dancing on the head of a pin” type of debate. The reality is that Sen. McConnell successfully forced a change to the Senate rules which govern the filibuster. This now continues the erosion of one of the greatest tools that we have used to defeat gun control legislation over the past several decades. As we noted in our alert this week, we’ve stopped semi-auto bans (in 2000, 2004, and 2013), magazine bans (in 2013), bans on the private sales of firearms (in 2013 and 2019), and gun confiscation (in 2019). And the one thing all these victories have in common is that they have died in the Senate as a result of the filibuster. Weakening the filibuster, as the Senate did this week, could very well grease the skids for gun control after 2020. Some Republican offices are trying to split hairs by claiming that the rules change this week only affects filibusters of presidential nominations. Senators who regularize the use of “cheating” in order to get their way in the Senate have no ability to set limits on others proposing to use the same sort of “cheat scheme.” Harry Reid tried to do this in November, 2013, when he tried to “nuke” nominations — but to exempt Supreme Court nominations. Just as the invocation of the “nuclear option” in 2013 eliminated the filibuster of Supreme Court nominees — while claiming not to — the invocation of the “nuclear option” now will eliminate the legislative filibuster, despite what its proponents argue. For more information on this issue, interested readers can view a three-page memo that GOA’s Legislative Counsel Michael Hammond provided for Senators and their staff. Also, gun owners can view the two Senate votes on this subject here and here, where “aye” was the correct vote. The only Republicans who broke from McConnell and voted to keep the filibuster (and subsequent 30 hours of debate) at full strength were Senators Mike Lee of Utah and Sue Collins of Maine. They should be thanked.